Dental implants are among the most successful procedures in dentistry. However, there are no guarantees that an implant procedure will be successful. Given the complexity of the procedure, there are many variables that can play into the success rate. The studies show a five-year success rate of 95 percent for lower jaw implants and 90 percent for upper jaw implants. The success rate for upper jaw implants is lower because the upper jaw is less dense than the lower jaw, making the success of implantation and osseointegration slightly more difficult to achieve. The lower posterior implantation has the highest success rate for all dental implants because of the density of the bone, there’s more to work with. Other factors that have an impact on success are pre-existing dental or general health conditions or the position of the replaced tooth. Dental implants may fail for a number of reasons, but the most come reason is the failure of the implant device to properly osseo-integrate. The actual failure of the implant may be the result of poor positioning or over torqueing in the bone. Although infrequent, dental implants may break or become infected or crowns may become loose the same way your natural teeth become loose. If you are a heavy smoker, your dentist may advise you to give up smoking before undergoing the procedure because smokers statistically face a higher risk of implant failure. Given how expensive implants can be, one risks wasting money on dental implants if you can’t give up the habit. Other high risk candidates are patients with diabetes, hemophilia or immune deficiencies and rare instances, patients with chronic bruxism. As I have noted in other articles the value of implants is significant with respect to bone retention and actual functionality, and they are not susceptible to the formation of cavities. So as long as one engages in good oral hygiene, i.e. with brushing, flossing, and regular hygiene procedures, the chances of peri-implantitis (characterized by inflammation or swelling of the tissues surrounding the implant) should be avoidable. This disease is similar to periodontitis around one natural tooth, and thus requires a similar approach to good oral hygiene. Key factors in minimizing dental implant complications are the selection of an experienced prosthodontist and oral surgeon who specialize in implant dentistry, careful pre-operative treatment planning and proper after-care and oral hygiene. If you would like to know whether you are a candidate for implants please feel free to call for a free consultation. Dentist Serving Dunwoody – Myth #1: Root Canal Therapy Is Painful, Wrong! There are few phrases that invoke as much fear and anxiety as these words from your dentist, “you need a root canal.” Where does this anxiety come from? In his state of the union address, President Obama said of the bail out, “I hated it. You hated it. It was as popular as a root canal.” Clearly, root canals are not very popular. The endodontist, a dentist who has two years of residency training in, among other things, performing root canal therapy, should be the least popular of all dentists. Yet if you have an all-consuming, head splitting toothache, the endodontist is the first person you want to and should see. An endodontist, with their advanced training, can relieve you of your toothache in one appointment. In this way, it would be better to understand endodontists as specialists in treating and preventing toothaches. Inside of every tooth is tissue, called the dental pulp that helps the tooth grow and develop when the tooth is young. If the pulp comes in contact with bacteria through deep decay, a restoration, or a fracture, it can become damaged. In this way, toothaches are caused by inflammation or infection in the internal tooth, pulp, or surrounding bone. Antibiotics and anti-inflammatory medications will help control the symptoms but cannot resolve the problem. Root canal therapy, so named because the treatment takes place within the tiny roots of the tooth, is a procedure for cleaning and disinfecting the internal tooth structure. Think of it like having a very small filling deep in the tooth, so small that endodontists work with special instruments that are as small as a hair’s width in diameter and a microscope to help with vision. Typical treatment time depends on the complexity of the case and the number of roots within the tooth. Your visit can be anywhere from half-hour to two hours with longer treatments often divided into two separate visits for your comfort. In many respects, the experience will be indiscernible from having a filling. Sometimes root canal therapy is indicated as a means to prevent an infection and toothache, which is why your dentist or endodontist may recommend root canal therapy on a tooth that has never caused any problems before. He or she is only looking out for your best interest, saving you from future discomfort and infection. Any time a tooth can be treated prior to infection, the procedure itself will be more predictable and easier on you, the patient. Root canal therapy is a comfortable procedure. The treatment itself is performed under local anesthesia and there is no associated feeling. When it is over, you can often return to work or to enjoying your day. When people wince at the thought of a past root canal or describe a past experience, they are either referring to the toothache that caused them to need treatment, or were not under the care of a specialist who has advanced training, tools, and techniques. Sedation is offered in some offices, but it is not needed in the vast majority of cases. Patients, much to their own disbelief, very often fall asleep on their own during the procedure. If you are referred to an endodontist for root canal therapy, there is nothing to fear. Your endodontist should make every effort to answer your questions and make the process as relaxing and comfortable as possible for you. If you have a toothache and are referred to an endodontist, know that you have already been through the worst part, you are heading to the right place, and treatment will have you feeling better quickly, often as soon as your endodontist numbs the area. 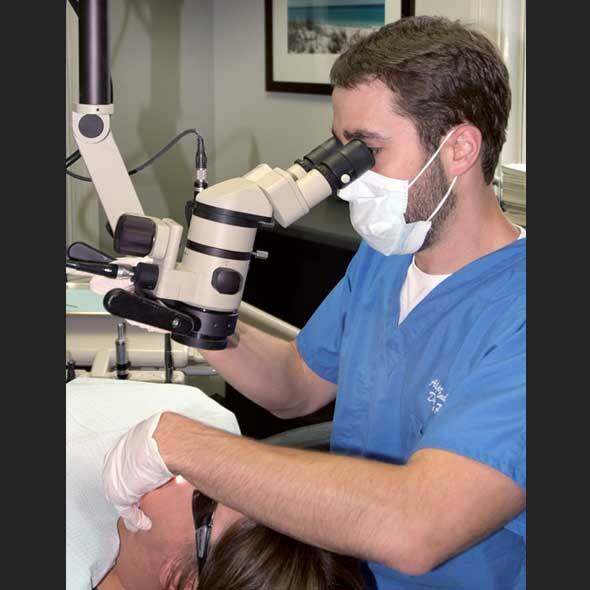 If you need additional information or have questions, this article was contributed to the Right Smile Center by Dr. Justin M. Parente of Alpharetta Endodontics. Dr. Parente received his DMD and post graduate Endodontic specialty training at Medical College of Georgia and is a member of the American Association of Endodontists. We are a multi-speciality practice with the capability to perform most procedures under one roof in our Sandy Springs, GA office. If you need help with an emergency tooth ache or other oral health issues feel free to contact us.